"It became obvious that conventional medicine wasn't doing the job," Thomas says. He decided he wanted to learn more about alternative pet care treatments, so he went to Colorado State University's veterinary school and took a course on Chinese medicine more than 17 years ago. When he came back to practice in the Inland Northwest, his methods may have raised eyebrows at first. 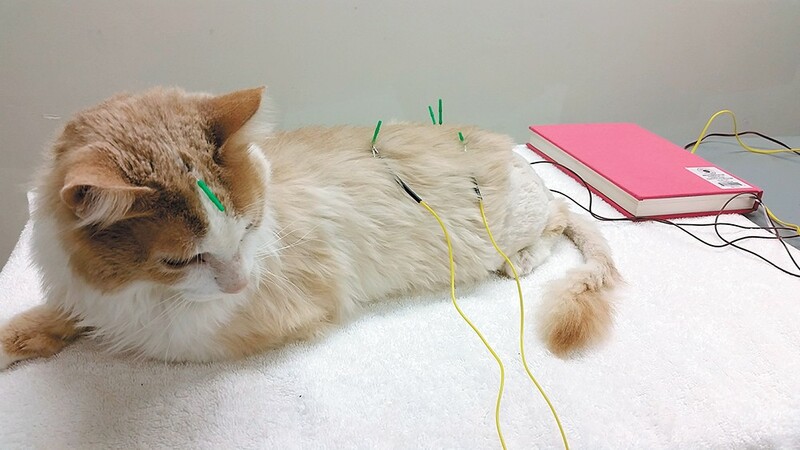 He used acupuncture, which involves stimulating certain parts of the body with needles. In recent years, he's used cannabidiol, or CBD oil. He's encouraged pet owners to stick their pets on raw food diets. For Thomas, who retired in April, these are not just tools for treating pets outside of traditional Western medicine. Chinese medicine, he says, is a whole new mindset. "It deals with a pet's body not as a material object, but as an energetic object that reflects onto the material body," he says. "That's the magic of alternative medicine." Whether other veterinarians see the rationale the same way, many are starting to recognize that some alternative methods do work — at the least, as a supplement to conventional medicine. The vets only gave Linda Shook's Jack Russell terrier, Maggie, a 5 percent chance of surviving. As a puppy, Maggie had pneumonia that scarred her lungs. All she did was sleep. Shook tried conventional medicine, but none of it worked. Then, her vet recommended acupuncture. She's been taking Maggie in for acupuncture ever since, for the last 12 years. "She's had a great life," Shook says. Donna Troyer, a veterinarian who's been doing acupuncture for pets in Spokane for three years, says acupuncture can treat a variety of ailments, but works best for pets who are old and in pain or who have dementia. It won't cure cancer, but it can help extend the pet's life or make the animal more comfortable. Troyer says pet owners always look surprised when the animals let her administer the needles. "For the most part the animals are nice," Troyer says. "Sometimes animals are restless, stand up with the needles in place and shake them all out — that can be challenging — but they learn to hold still." Jessica Bunch, a Washington State University medicine service coordinator, says acupuncture is the most-used "alternative" treatment used by WSU. She's even used it for her own pets. "There's been enough scientific data to know it works for pain, arthritis, back problems," she says. "With a lot of different things, sometimes adding acupuncture can help and improve quality of life." Veterinarians are mum on the use of CBD oil for pets. It's not FDA regulated, so its effectiveness and risks depend greatly on the manufacturer. Right now, everyone in the veterinary community is waiting for research. Colorado State University, for example, is looking into the efficacy of CBD for the treatment of epilepsy and osteoarthritis in dogs. "We are pretty reluctant to prescribe it at this point," Troyer says. "Everyone is waiting with bated breath." But she does hear plenty of anecdotal evidence. Spokane resident Dwayne Tifft says he's recently started giving CBD oil treats that he buys from Sativa Sisters to his dog, who has arthritis and Cushing's disease. The dog, before getting CBD, couldn't get up off the couch, Tifft says. With the CBD-infused biscuits, Tifft notices a huge difference. "She seems to do better, she's walking around and stuff," Tifft says. "It has to be doing something." WSU's Bunch says she hear similar stories all the time. But she's cautious about recommending it at this point. "The biggest thing is to make sure to be careful what you're getting," Bunch says. For the veterinarian Thomas, telling pet owners to feed their pets raw diets, an emerging trend, is a no-brainer. Doctors tell people to heat healthy, fresh, wholesome food, he says, so why wouldn't the same be true for pets? Bunch is more skeptical. She has clients who feed pets raw diets, but she worries about food poisoning. She says there's been no published research that says raw is better than processed food, but there is research that shows raw food contains more pathogens that could harm a pet. She's not sure if the benefits outweigh the risks. Whatever alternative option you're considering, whether it's acupuncture, CBD oil, raw food or herbs and supplements, Bunch says it's important to consult with someone who has been trained in alternative methods beforehand. "There's so much out there," Bunch says. "You're probably not doing harm, but you might be wasting money."